These CrossFit workouts are perfect for anyone out on the road or who simply can't get to the gym for some reason. These "30 Crossfit workout you can do at home" are all by Pat Hanavan [if-fit.com]. These are “no equipment necessary” workouts other than a stopwatch, a pull up bar (easily improvised) and a jump-rope – which takes up no space at all. So, whether you are planning to exercise in your hotel room, your front room, your garage, the local park, or your backyard here are 30 Workouts to try. Don’t forget to time yourself when doing these workouts. That way you can notice improvements in the future. The majority of these are against time, anyway, unless otherwise stated. Your Classic Gymboss and Gymboss miniMAX are the best crossfit timer as it functions as both a stopwatch or an interval timer. Below we show you how to set them up to time these 30 workouts. 1. Run for a half mile, followed by 50 push-ups x 3 times. 2. Run for a quarter mile, followed by 50 pull ups x 3 times. 3. Run for a quarter mile, followed by 50 squats x 4 times. 4. Run for one mile, followed by 100 pull ups, 200 push-ups, 300 squats then run another mile. 5. Run a quarter mile, then do as many pull ups as you can x 5 times. 6. Do a series of pull-ups and dips – counting 50, 40, 30, 20, then 10 of each. 7. Do a series of double-under’s and sit-ups – counting 50, 40, 30, 20 then 10 of each. 8. Using your max weight do 7 sets of 1 rep weighted pull-ups. 12. Do 50 squats, followed by 100 rope jumps x 5 rounds. 13. Do a series of 30 walking lunges, 20 pull-ups, run for a quarter mile then 30 box jumps, 20 dips and another quarter mile run. 14. 12 Burpee’s, followed by 12 pull-ups x 10 rounds. 15. Do a series of 50 double-under’s, followed by 75 squats x 3 rounds. 16. Do a series of double-under’s, push-ups then pull ups – 50, 30, then 20 of each. 17. Complete 5 box jumps, followed by 10 pull ups, and 15 knees to elbows as many times as you can in 20 minutes. 18. 50 Squats followed by 30 pull-ups and 15 handstand push-ups x 5 times. 19. Do 5 pull-ups, followed by 10 push-ups then 15 squats x 20 rounds. 20. Run 5k as fast as you can. 21. Run for a quarter mile then rest for 2 minutes x 4 times. 22. Run for a half mile then rest for 2 minutes x 3 times. 23. Complete 5 medicine ball cleans, followed by 10 pistols and 15 double under’s – do as many as you can in 20 minutes. 24. Complete 50 sit-ups, followed by 50 double under’s, then 50 more sit-ups, then 50 walking lunges, then 50 Burpee’s, followed by another 50 sit-ups. 26. Sprint a half mile uphill, then a half mile downhill. 27. Run 100 meters as quickly as you can, rest for 1 minute x 10 times. 29. Run a half mile, then a quarter mile backwards x 2 times. 30. Complete 25 inverted Burpee’s, followed by 25 pull-ups and 25 Burpee’s x 5 times. All of these CrossFit workouts by Pat Hanavan can be timed easily using your Classic Gymboss or miniMAX timer. Most of these 30 workouts are done against time, which means you do the workout as fast as you can and time yourself using the stopwatch feature on your Gymboss. The next time you perform the same workout, try and beat your time. A few of these workouts require you to rest for a certain amount of time after sprinting, then repeat. Finally, a couple of these workouts are done for a set time, usually 20 minutes. Your Gymboss can time all of these to! 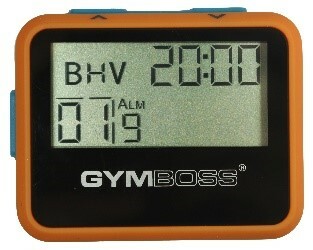 #’s 21 and 22: To time the rest period during these workouts, set your Gymboss for one interval of 2:00, for 1 round. Proceed with your run, when done, push start to begin timing your 2:00 rest period. When the timer beeps/vibrates, repeat. 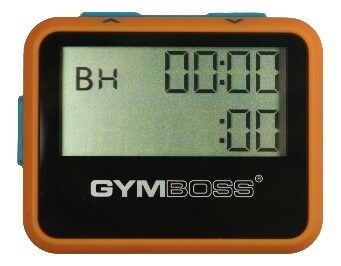 # 27: To time the rest period during this workout, set your Gymboss for one interval of 1:00, for 1 round. Proceed with your run, when done, push start to begin timing your 1:00 rest period. When the timer beeps/vibrates, repeat. ALL OTHERS: All of the other workouts here are done against time, which means you do the workout as fast as you can and time yourself using the stopwatch mode. The next time you perform the same workout, try and beat your time. 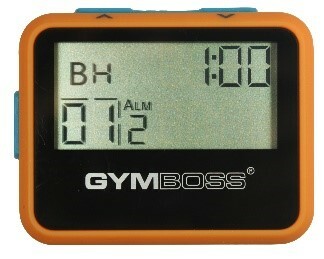 Simply put your Gymboss in stopwatch mode and press Start.